Dealing with Diam, a healthy appetite for Ah-So? I’m not sure as to the total number of wine bottles I personally open each year but it’s to the tune of several thousand. When you’re dealing with anything on that scale, whether it be sharpening a pencil or cutting hair, you quickly start to look to for shortcuts if they exist. 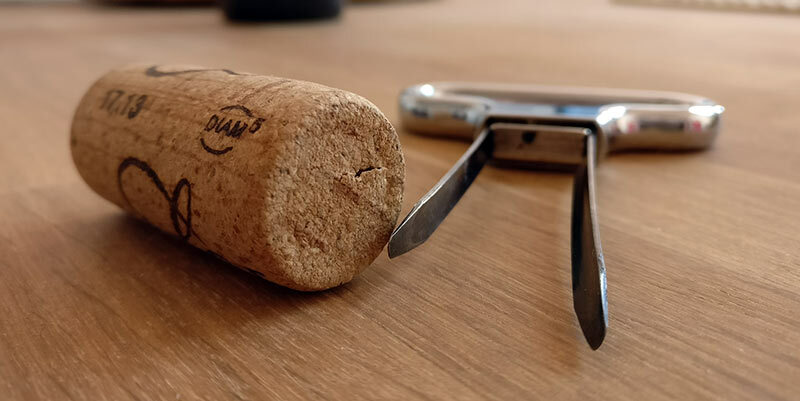 This is why I’ve taken to the Ah-So as once you understand how to use this two-pronged item, it’s actually faster to open bottles with, doesn’t chew up older corks, and it really saves your shoulder when compared to using a traditional corkscrew. It’s become quite crucial for large tastings like I’m doing now for several regions including Roussillon in France. And it’s specifically from these just-across-the-border French wines that I’ve encountered a larger percentage sealed with the rather new closures called, Diam. It makes sense as one of their factories is actually in Céret, right smack dab in Roussillon. For those unfamiliar with this sealing option for wine, it’s taken the wine world by storm. While still composed of natural cork, it’s put through a process that theoretically eliminates the great wealth of chemicals and organisms that can taint wine and are often found in natural corks which have been hewed directly from the cork tree’s bark. Additionally, due to the consistency of their make up, they can massively reduce if not fully eliminate oxidation issues which has led to white Burgundy producers starting to embrace Diam closures as well. They’ve seen something like 25% growth year over year which is incredibly impressive given that they’ve had to overcome perception issues in that their corks readily look like the cheap composite corks found in bottom-end wines. Also, convincing the winemakers to use such a novel new product on their higher-end wines is always a tough sell but they’ve made a great deal of headway on this front. This gets back to original mention of the Ah-So and that things seem to go weird when using one on Diam closures. I’m not sure if it’s the longitudinal rigidity of how a natural cork is structured but for some reason, the Ah-So has a tendency to torque a bit sideways when pulling out a Diam as if you’re trying to twist out a thick sponge from the bottle. I had some issue getting out a few of these corks but then hit a Diam 5 that basically swallowed up the tines of the Ah-So and when leveraging it out of the bottle, one bent to the point of unusability. Now the device sits by the entrance to live out the rest of its days as a novel letter opener. Undoubtedly, someone could easily say that the Problem Exists Between Chair And Wine by using logic similar to the fact that just because I’ve been driving cars for 25 years, it doesn’t mean I’m a good driver. Perhaps I’m not a good Ah-So user despite the amount I use it but it’s either that the cork comes right out quickly or then not at all like when you mess up trying to get out a fully-synthetic cork. This behavior I’ve not seen with other cork-ish closures other than the Diam ones. I’m very curious if others have had this problem or if it’s just me? In addition to using the Ah-So if I want to open bottles, I’ve started making use of my Coravin to pour tasting samples. This is for a variety of reasons, the main one being that I want to keep the bottle whole so I can a) return it to the winery if a small production wine of limited bottles or b) give it to friends who can then drink it when they want. I generally have more wine than I can sensibly drink so these bottles would end up down the sink otherwise and as accorded by UN Resolution 1855-WIFD: is a felony. Diam has made me pause on this worth cause however. Fully-synthetic and composite corks simply don’t work with the Coravin as they won’t seal back up once punctured. But with Diam, there have been cases where the same behavior happens and I’ve had leakage when the bottle is set on its side. It doesn’t happen all the time and I’ve not been able to set up a proper study on this nor see if there’s a difference between the classifications of their closures but it’s definitely there on some level which is problematic. It’s difficult to make claims that a bottle closure, composed of natural materials at its base will simply never taint a wine. Even if there’s just one case of it reported it will give every wine producer pause even though everyone knows that corks are most definitely flawed–although not nearly as much as they used to be. I mention this as apparently it’s been noted that Diam closures can cause bitterness. I’ve not seen this myself but as always, I wouldn’t say that it’s impossible. Also, I have a cork sitting to the side of my tasting space right now which I need to get back to the cellar as there was definitely TCA (cork taint) in the wine I tasted and it wasn’t a cheap wine. The only question now is whether the taint came from the closure or the wine as TCA can spread on many different fronts, not just from corks. But, it’s beyond my means to analyze it to find out where the fault lie, especially as it seems there is anecdotal accounts of TCA happening in Diam-sealed wines. But the bigger issue I see is the one of reduction which, beyond issues of TCA would be the main one of two reasons someone would opt for Diam over screw cap; the second reason being the idiocy of perception as to how a how should by opened which I doubt will change in my lifetime. Reduction is that sulfur/cabbage smell you can find when opening some wines as the liquid has been starved for oxygen. It is in fact the opposite of oxidation and wines sealed under screw cap will quite often have a whiff of it even though screw cap producers have made large strides in reducing it and I don’t doubt they’ll eliminate it completely given how many wines go under screw caps these days. I have most definitely found reduction in Diam-sealed wines and even in one that was 100% Grenache which is not a reduction-prone grape. I fully trust this wasn’t a result of the winemaking and others have mentioned that they’ve found it as well. This all then makes me wonder as to what the specific advantages of Diam are currently? I suppose it’s just to give the appearance of cork without the problems of cork and the negative feelings towards screw cap. We’re headed towards some kind of closure singularity though as nothing is perfect and all are improving. Whether it’s natural cork producers cleaning up production, Diam fixing what faults the still have, or screw cap producers dealing with theirs and the general public ultimately not giving a crap if the wine makes a pop or a crick when opening it. Surely the “perfect” solution is within our grasp.